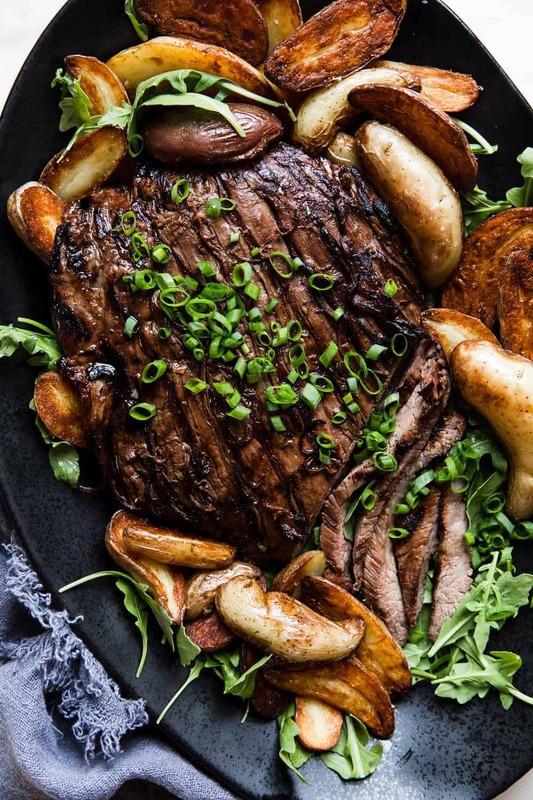 Brown Sugar Garlic Flank Steak is made with the most amazing brown sugar garlic soy marinade. The steak is grilled to perfection and melt in your mouth delicious! 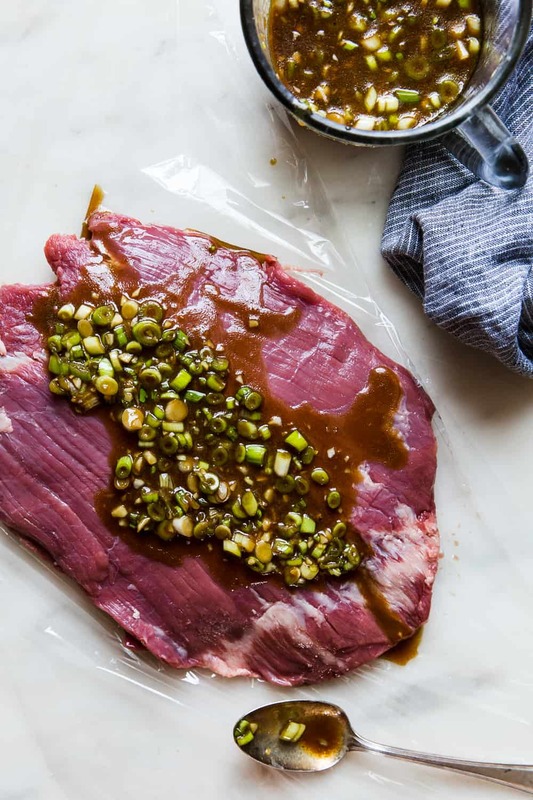 I have a delicious flank steak recipe for you today and something that will also be life changing for you in the kitchen. 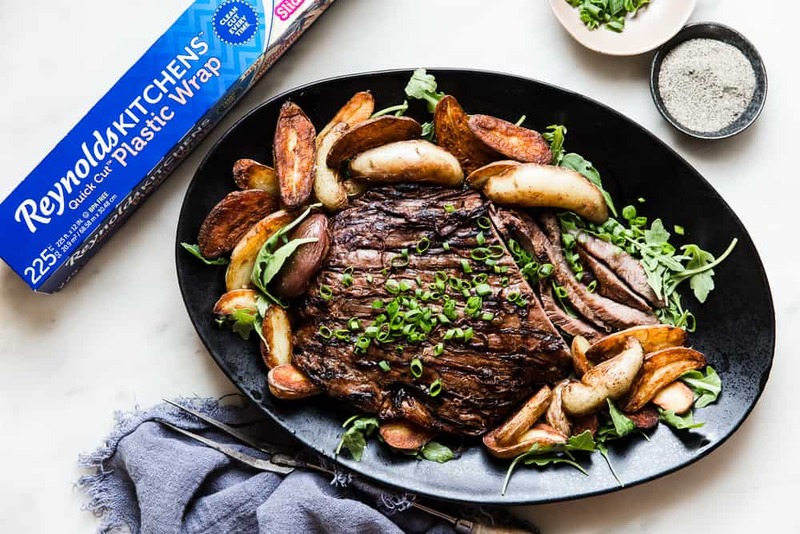 You may never think about plastic wrap the same after you read this post….. seriously! 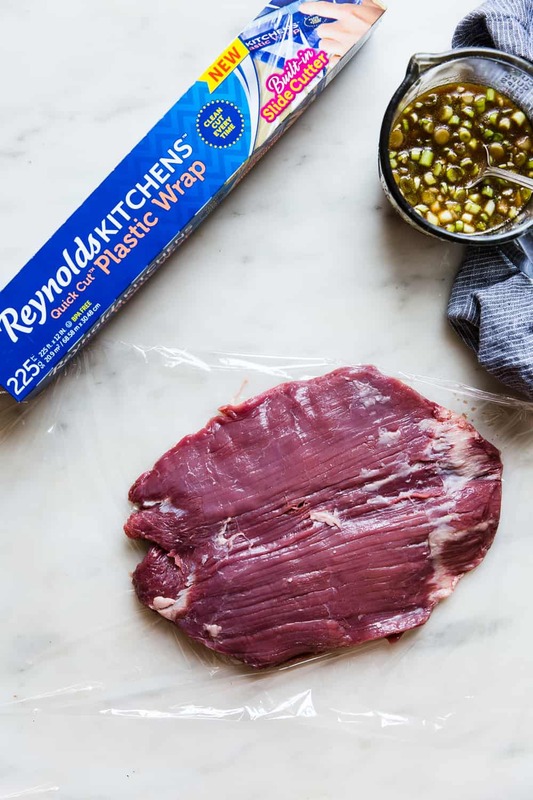 Reynolds Kitchens is eliminating all of your plastic wrap headaches and have just launched their new Reynolds Kitchens Quick Cut Plastic Wrap with a built in slide cutter to help make plastic wrap usage frustration free! 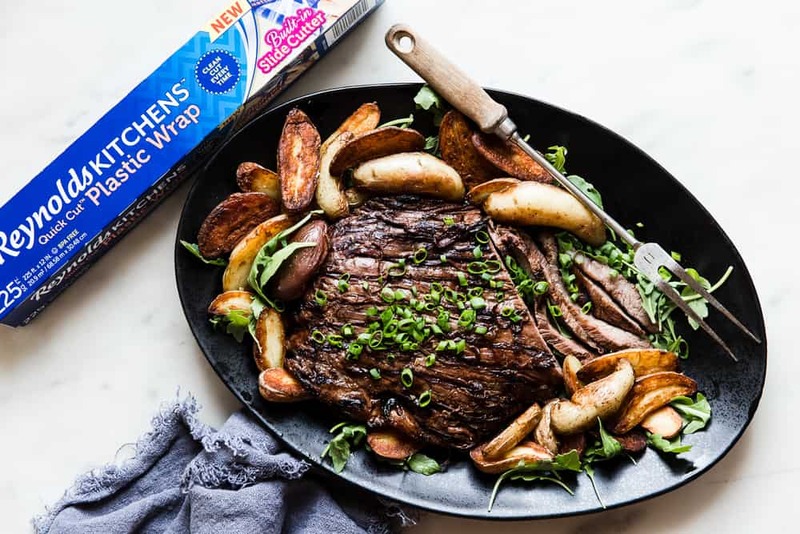 Reynolds wrap is bringing you all of the new features that solve all of your plastic wrap troubles. A built in slide cutter, which makes dispensing super easy, a grip strip that keeps the roll in place, a starter edge so you can find the start of the roll and built in end tabs that keeps the roll securely in place. We all need to use plastic wrap in the kitchen and it is such a love hate relationship. It doesn’t have to be that way anymore. Plastic wrap is now so easy to use and it helps to keep that long lasting tight seal to keep food fresh. This is perfect for meal prepping and storing your food! I had such a fun opportunity this spring to go to Des Moines and New York and help demonstrate this amazing new product. 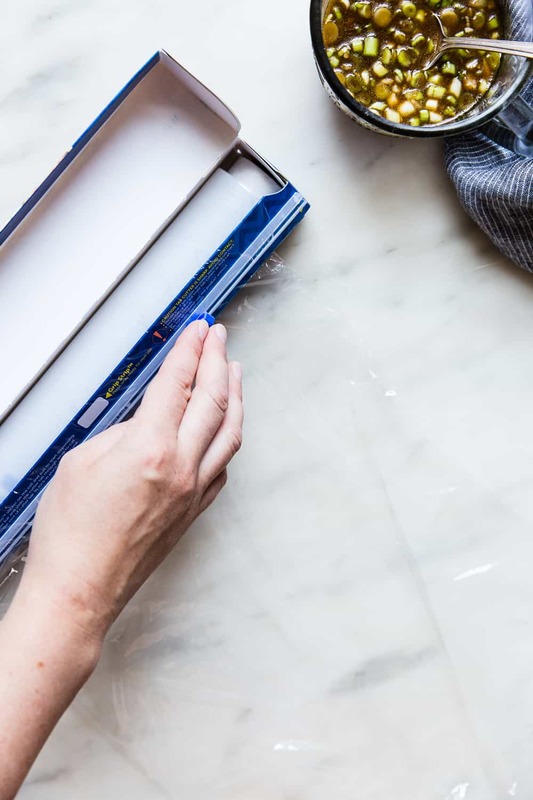 There are so many different hacks and uses for this plastic wrap. One of my favorites was to use it to cover surfaces before working with raw meat. I use this hack every single time that I am using raw meat in the kitchen and need to protect the surface. This makes for great clean up as well. I used the hack for this recipe and then it was so great for wrapping it up and sealing in the marinade. 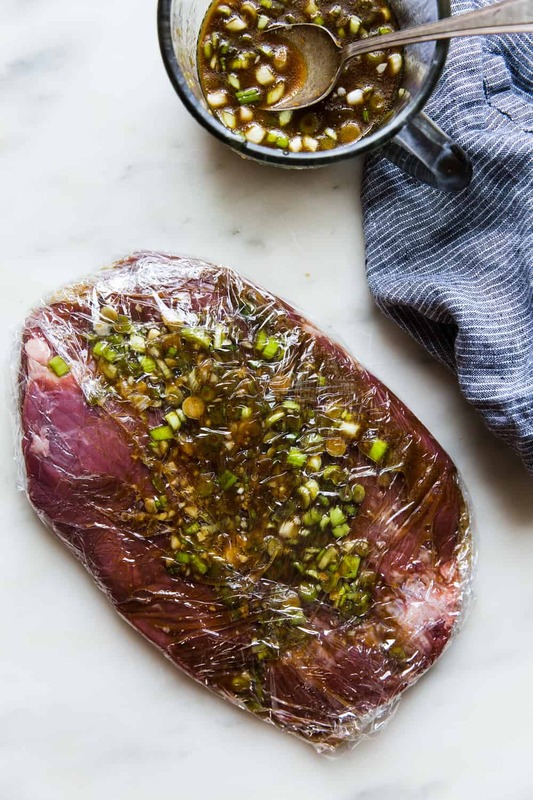 Today, I am going to show you how to make this delicious flank steak and use this hack in the kitchen all of the time for yourself! 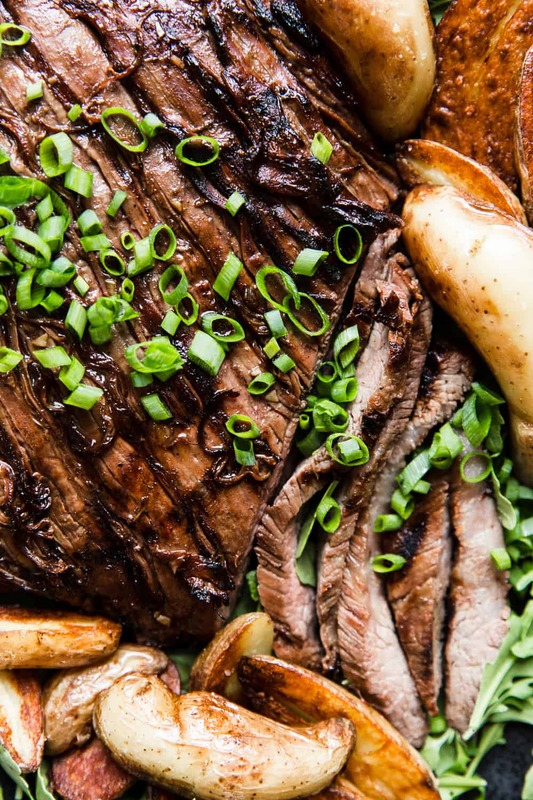 How do you make Brown Sugar Garlic Flank Steak? Prepare your marinade by mixing together the garlic, brown sugar, olive oil, Worcestershire, soy sauce, dijon, green onions and salt. On a clean surface lay out two large pieces of Reynolds Kitchens Quick Cut plastic wrap slide by side, with 2 inches overlapping. This creates and extra large rectangle. Pat steak dry using a paper towel and set in center of prepared plastic wrap surface. Pour marinade mixture over the steak and pull the sides of the plastic together until steak and marinade are tightly sealed. If needed use an extra piece of plastic wrap to seal up any loose ends. Set in refrigerated for 4 hours or up to overnight. Preheat grill to high heat and remove plastic and set prepared steak directly on grill. Allow to cook without turning for 3 minutes. Flip and cook other side for another 3 minutes. Continue flipping back and forth until steak reaches desired doneness. Allow to rest for 10 minutes before slicing. What temperature do you cook flank steak on the grill? Medium Rare takes about 6 minutes on the grill turning only once. It is 130-135 degrees on an instant read thermometer. Skirt steak or flat iron steak is a good substitute. You can also use this marinade with your favorite cut of steak. I especially love this hack because it seals in that marinade and keeps the flavor inside. You wrap up the meat tightly and as soon as it has had time to marinate, you simple throw the wrap away. This makes clean up a cinch. Since school is back in session and we need dinner on the table quick, I love that flank steak only takes about 6 minutes on the grill. It is on the dinner table in no time and all. And everyone devoured it! My kids are steak levels and we sure love this recipe! 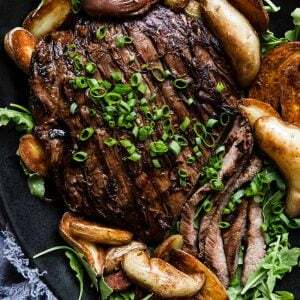 What side dishes can I serve with flank steak? What other hacks can I do with plastic wrap? Use the plastic wrap to cover your surface and roll out dough. Cover your stand mixer with plastic wrap to keep the dough and flour within the bowl. Use it to prevent freezer burn. Cover the ice cream and then put the lid on top to create a seal. Put it over your iPad, iPhone or cook book to protect the surface while in the kitchen. Speed up the ripening process with avocados, or wrap the end of bananas in plastic wrap to slow down the rising process. Create piping bags with the plastic wrap and have multiple colors of frosting in your piping bag. In a small bowl mix together garlic, brown sugar, olive oil, worcestershire, soy sauce, dijon, green onions and salt. Preheat grill to high heat for 20 minutes. Remove plastic and set prepared steak directly on grill. Allow to cook without turning for 3 minutes. Flip and cook other side for another 3 minutes. Continue flipping back and forth until steak reaches desired doneness. Allow to rest for 10 minutes before slices. This post was sponsored by Reynolds Wrap. I love working with brands that I use in the kitchen for myself. All opinions expressed are my own! great marinade and recipe, gorgeously photographed too by the way, thank you for this recipe! Great steak!! Thanks for the hacks! I’ve tried several of your recipes over the last couple of weeks for my wife and two adult sons. We have loved them all. Just wanted to share a couple of adjustments I did to this flank steak recipe that went very well. I pan seared the steak for 3-4 minutes on each side at med-high heat in olive oil, poured the marinade over the steak ( I marinated in a gallon freezer bag with one med white onion instead of the green onions) and then put in a 250 degree oven for 1 hr and 40 min. I happened to be out with my wife when the timer went off and had my 18 y.o. son turn down the heat to 200 degrees until we returned about 30 minutes later. Upon our return home I checked the steak and it was so tender it fell apart when I started cutting it! It was absolutely delicious. I also prepared your Brown Butter Garlic Carrots and your Roasted Parmesan Cauliflower (I also added a head of broccoli to this recipe to make a medley). All in all it was a fantastic meal that was all your recipes!